When Elise asked for a pink cake during Vacation Bible School week, I sighed. I don't think Pepperidge Farm makes pink cakes. We whipped a pint of cream with fresh strawberry puree and used it to frost an angel food cake. I held my breath when Andrew wanted to get fancy with the decorating tips. The soft pink cloud began to look like a pile of fat pink worms. I tried my best to freeze the moment in the way all mothers do. Watching their heads bent in concentration, debating the placement of each strawberry slice. No Playdoh gift set could have diverted them from this important work. We decorated our own cake to save money, but we learned, once again, that the real joy is in creating. You knew this was coming: where'd you find those quilts!? How sweet is that! Creating memories as well as cake is always a bonus! Meredith, she is SO darn cute! Good for you! I know those kids were proud of what they created. That's priceless. And better than any Pepperidge Farm cake! Seems to me you said YES! And I bet the kids thought it was the best cake ever! I'm cheering for you! I love saying yes. Thanks for reminding me once again that "perfect" is not important, but achievement is! For the first time ever my 12 year old made my birthday cake with no prompting fromme. She got her 8 year old brother to help frost it and it turned out lovely! It was a good feeling to let the kids go at it on their own! Good for you! So cute. These are the thing they will remember as adults. Fond memories... so worth it! So precious, those moments. I have to add *deep breath* to that moment when I try to freeze frame... let go the mess, let go the ideals... and embrace the joy! Happy, happy birthday, sweet Elise! I know you are one proud mama! You have once again shown us that the best things in life are "free!" 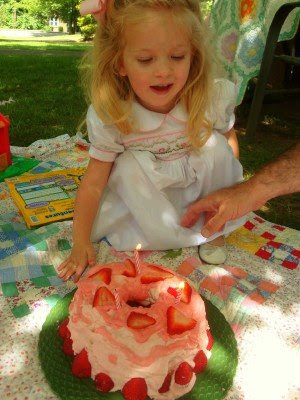 *Love* the pink birthday cake... so intently decorated with *love*... Thanks also for mentioning the Queen's Tea... I enjoy sharing so that everyone can 'attend' the tea whether they are there or not! I think it's really sweet that you let them help decorate the birthday cake rather than worrying about it looking perfect. What fun for them! Oh, and I think Elise is a real sweetie, but I like her even more now that I know she likes pink! A girl after my own heart. What fun! We found cupcake note cards on clearance at Michael's for 47 cents a piece, and matching small plates and napkins. I tend to make cupcakes as it saves the mess, and my daughter was thrilled with the idea of her cupcakes and matching cupcake plates. I think the strawberry cake looks and sounds wonderful, which is strange since I don't really care for strawberries. Must be the babies' idea! Oh gosh, her dress reminds me of one I had when I was a little girl. It had similar stitching, but had balloons all over it. I loved that dress. Help her cherish these moments as you do. They have the joy of creating a delicious, beautiful cake, and you get the joy of co-creating (with God) beautiful, joyful children. 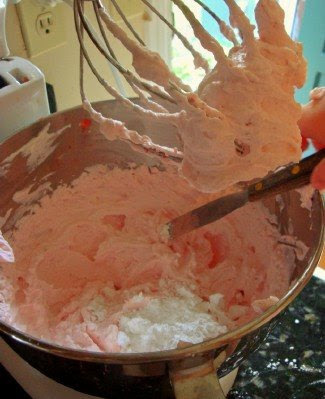 I will have to file away the idea of strawberry puree with whipping cream--YUM! What a neat frosting idea. My sister is diabetic and we always had homemade angel food with whipped cream and crushed strawberries. Same flavors, but what pretty looking whipped cream! I will pass on the idea to her and I have no doubt that we will use at a family birthday when we are all together! Thanks for the inspriation. great job saying yes, my kids love to bake and at 5 1/2 and almost 4 they know their way around the kitchen...it brings me such joy to share this with them. What a beautiful birthday party. Very fit for a precious little girl. Elise must have loved all the pink! Sounds delicious and what wonderful memories those will be. That frosting sounds absolutely divine! Elise is such a beautiful little girl, Meredith. Your birthday party just looks like it was perfect- the outdoors just looks lovely. It would make a beautiful Hallmark card. Seriously! what's the recipe for your strawberry puree? It's beautiful - I love it - it's great that you let your kids be creative and help decorate the cake. 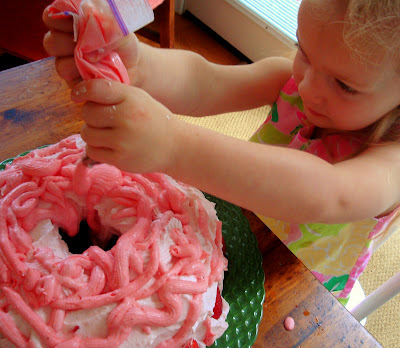 This looks SO MUCH EASIER than the princess castle cake or doll cakes I've made in the past. :) Way to go, Mom! (Plus, it looks a lot healthier too). These are the moments that both of you will always talk about and remember! A picnic celebration sure looks like fun! Elise looks like she's enjoying her cake, both making it and blowing out the candle! My son will be 3 next week, and he would never let me get by with just one candle! He'll insist on three! Just thinking that I remember the post when you announced your pregnancy with Elise and how can that have been over three years now?!? I don't know when you started LMS but I have been reading you most of the time I've been a mama (my Sean turned five in April) and you've given me much inspiration and peace. Thank you. Don't worry, I'm not so stingy that I wouldn't give a 3 year old three pink candles. I believe this shot shows her after she has already blown out the first 2. Meredith, I am so sorry I did not see the other candles in the picture! I still only see 1 when I look at it, I'm getting old and blind, I guess! One would be perfectly fine, I am just thinking of my own son and his current obsession with three. He asked for three balloons on the mailbox, 3 on the table and 3 on the deck. Elise had a wonderful celebration and I did not mean to indicate otherwise. oh - how cute! I love the finished cake!